Although, believe it or not, I am still seeing the immature eagles flying both over our yard and circling above the Shetucket River, their chatter has just about ceased. They are traveling much more yet remain in the area, returning to the nesting area. In fact, earlier in the week when returning from the dentist, there they were soaring together along the river. Pulling over to watch, I knew it was them. I just felt it. And then yesterday, as we stood outside talking to OS, one flew so low over our yard, ascending gracefully over the treeline. But just because I have taken on this new passtime, don't think that I ignore the other birds that frequent our woods. Woodpeckers...lots and lots of woodpeckers! Keeping the suet feeders filled, we have them all shapes and sizes. Downys, Hairys, Red Bellied and Pileated. 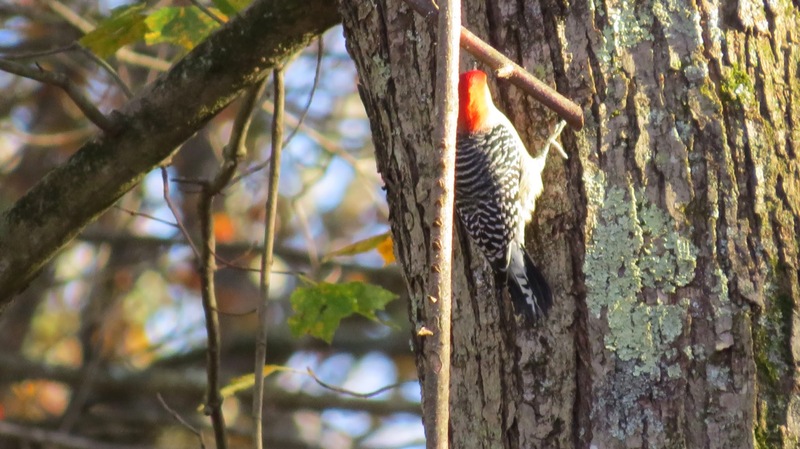 In fact this summer we had a young Red-Bellied that I got great shots of, don't you think? I think we only have three kinds of woodpecker over here. They are fascinating birds. Nice shots of your woodies! They are great birds!